I've been snowed in for 3 days and decided to work up an everyday cross stitched sampler. It is made to look as if a young girl, Ella has been practicing her needlework. 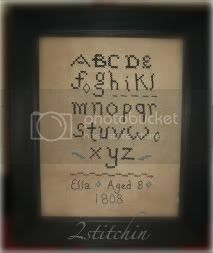 She has cross stitched her alphabet along with a few simple motifs, her name, age and the year 1808. A very plain and simple design that I created and stitched on coffee dyed toweling. It is stitched in black, mustard and an old blue. A sweet schoolgirl sampler for your home. I used a black distressed frame with glass and a hanger on the back. The measurements are 10 1/4" wide x 12 1/4" long. It will be signed, dated and copyright 2010. A wonderful piece for the sampler collector! October, a time to celebrate the Harvest, the Beauty and All Things Scary! What better time to have a 'giveaway' and a little fun! 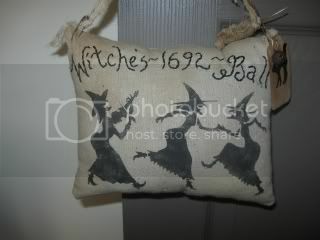 My giveaway is for my Halloween pillow hanger, "Witches~1692~Ball". It's a new design by me that has been "stitched, stenciled and stuffed". 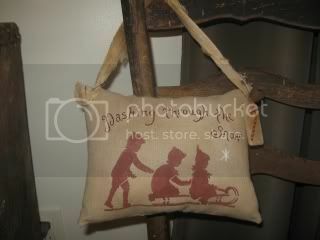 Three stenciled dancing witches along with Witches~1692~Ball is stitched on a piece of coffee dyed osnaburg. It is backed with osnaburg also and then was stuffed with polyfil. I attached a cat hang tag with a rusty bell to a coffee dyed cheese cloth hanger. The cheese cloth is attached by rusty safety pins and could be removed if you didn't want to hang it. But I think it would look so cute hanging off a hook, chair or door knob. It measures about 8"wide by 6" long. It is signed and dated 2010 on the back. I had so much fun making this up that I will no doubt be doing some more 'stitched, stenciled and stuffed' pieces. Shipping is on me but of course! I love how this needle punch book turned out. I did another one a few weeks ago of a Raven in the Tdipt Mercantile. This old weathered and torn book is really a box. The inside is covered with a purple velvet. 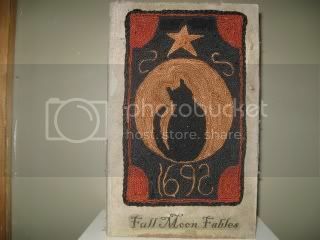 My needle punch is of a black cat in front of a full moon with the book titled "Full Moon Fables". I stamped a small black cat on the side of the book. I did my punching on weavers cloth with Valdani threads and finished it off with a black hand sewed cord. I attached the needle punch to the book with black carpet tacks. The book measures 6 1/2" by 10" long. This OOAK will come signed, dated and copyright 2010 on the back. 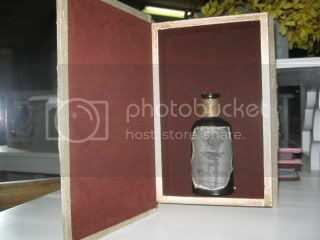 For an added little something I have an old looking bottle inside that I made with a scary label "Sanderson Potions Vampire Fangs". This book can be used with your Halloween displays or could be left out all year long if you like Cats! To me a log cabin always seems like an Autumn thing, nestled in the trees with leaves falling everywhere. 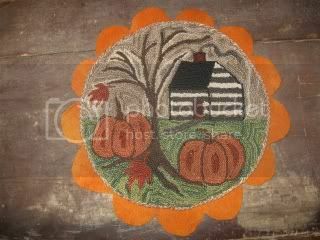 I designed and punched this flat piece with a log cabin, 2 fat pumpkins, some leaves and a tall bare tree. I used Valdani threads on weavers cloth for my punching. 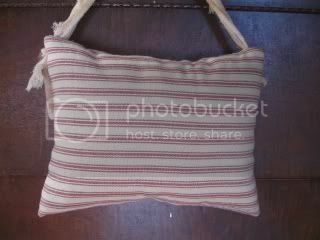 It is edged with a hand sewed tan cord and then backed with a beautiful scalloped orange wool that was also sewed. A fabric swatch with my name and date is stitched on the back. It measures about 9 1/2" in diameter. This OOAK will look wonderful laying on table mixed in with your Fall goodies. For those of you who Christmas shop early or may want to put a little treat aside for yourself I have this sweet Snowman Candle Paddle. 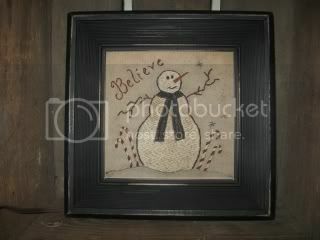 Designed and punched by me on weavers cloth with Valdani threads I have a snowman decked out in his winter apparel with 3 little snowflakes. I have a mustard color cording along the edge of the needle punch sewed for a finished look. I then mounted the piece with an acid free adhesive spray to the candle paddle. 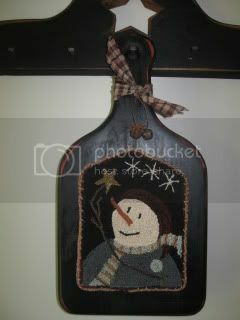 This wonderful paddle is from my tdipt sister, Pam of Goldieloo Woodworks. I painted the paddle black over a deep red and sanded it and then buffed with mini wax for an aged look. 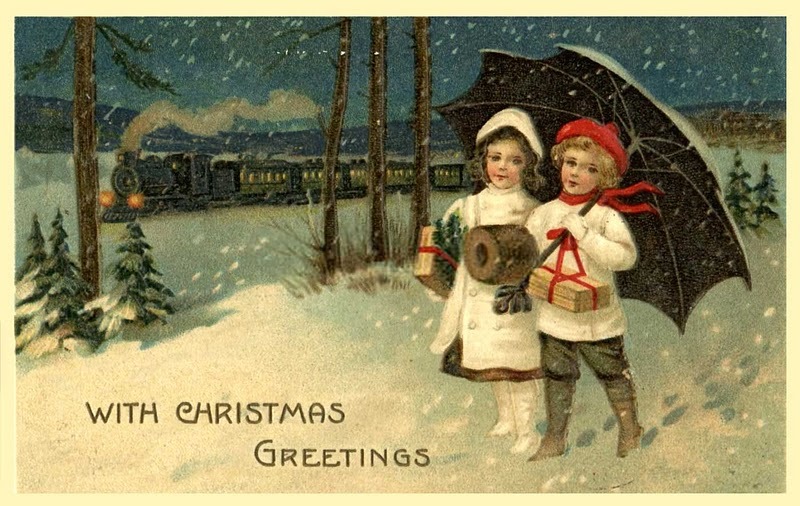 A piece of homespun is tied around the neck of the paddle along with 2 rusty bells and a snowflake. The measurements are about 6 1/2" wide by 13" long. This OOAK will come signed, dated and copyright 2010 on the back. Sure to become a keepsake and enjoyed for many years. 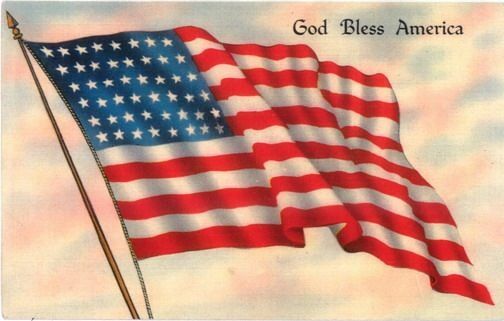 Thanks for stopping by to visit my blog. It's been ages since I have had any offerings here and I thought it was about time! It is hard to believe we are half way through the summer already. On sweltering days like today I am ready for Fall! To help cool you off I have 4 Autumn and Halloween offerings. *Please note for all the ditty bags that the cords are about 10" long. I only took one picture showing the entire length of the cord, I did just close ups on all the other bags. I have 3 needle punch ditty bags that I am offering today. 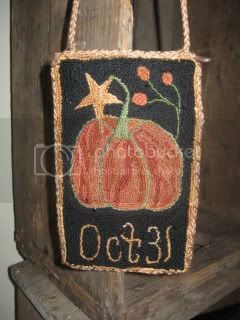 The first one is a cute pumpkin with with a mustard star hanging from the stem. I have a bittersweet branch and Oct 31 is punched at the bottom on a black background. I designed and then did my punching on weavers cloth with Valdani threads. I hand sewed a mustard cording along the edge and used the same cording for the hanger. I attached the hanger with rusty safety pins and finished off the back with a wonderful camel color wool. I have a tag sewn inside the bag with my signature, date and copyright 2010. The measurements are about 4x6 for the bag. 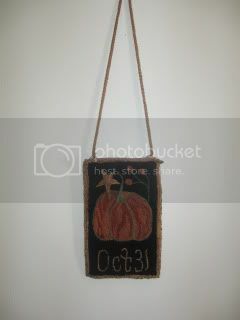 All of my bags will make sweet primitive hangers for your Autumn and Halloween fun! *sold*, But Taking Orders !! 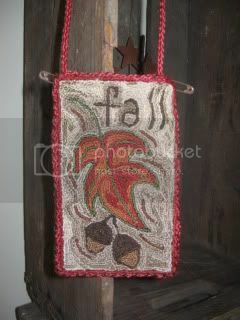 This little "Fall" needle punch ditty bag is another one of my designs. It features a single leaf with acorns and "fall" punched in the corner. It was punched in wonderful oranges and reds on a multicolor tan background. I used Valdani threads and it was punched on weavers cloth. A wonderful dark red wool is hand sewn on the back with a bittersweet color cording along the edge of the bag and is also used for the hanger. I attached the cording with rusty safety pins and a tag is sewn inside the bag with signature, dated and copyright 2010. The bag measures about 4x6. 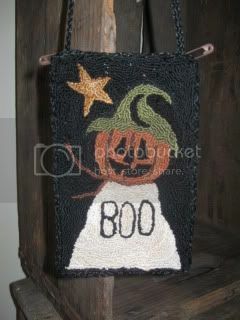 This little needle punch ditty bag that I designed and punched is a Jack O'Lantern with a green hat sitting on a ghost bottom that says "Boo" and a mustard star in the corner. I did my punching on weavers cloth with a black background using Valdani threads. I hand sewed a braided cord along the edge and the same cording is used for hanger. I attached the hanging cord by rusty safety pins. I hand sewed a piece of black wool on the back. On the inside is a tag that I signed, dated and copyright 2010. Perfect for a peg nail or hook, stuff with some berries or drieds for a fun Halloween hanger. Measurements are approximately 4x6. This 5x7 "Autumn" stitchery which was the original model for a pattern that was featured in the TDIPT Mercantile Booklet from last Fall. I forgot I had it until I started digging around in my Fall things. It features 2 pumpkins, golden wheat, bittersweet branches and a mustard star. 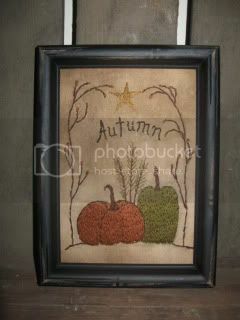 It comes in black distressed frame with glass and a sawtooth hanger. You can easily prop it up in a cupboard or a shelf if you choose not to hang it. It is signed, dated and copyright 2009. The cost is $30.00 which includes free shipping. Is it Spring Yet??? Thanks for stopping by to view a few of my new Spring Thyme offerings. 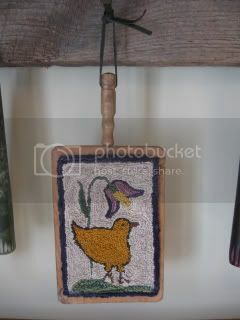 Here is a little spring peep and tulip needle punch that I mounted on a mini bread or chopping board. It is the cutest little board I found at a local antiques store. There is a handle and a leather tie. I did my punching on weavers cloth with beautiful Valdani threads, it was coffee dyed and then mounted with an acid free adhesive. You can't tell from the photo but the boarder is a dark purple to accent the tulip. I also nailed in some carpet tacks to give it a little bit more of a prim appearance. Measurements are including handle, 7 3/4" long x 3 1/2" wide. If you are finding yourself in need of a little more something for an Easter basket or a display, this small punch would be perfect. Designed and punched by me, copyright, dated and signed. 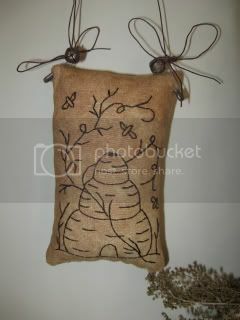 My second offering this week is for my Needle Punch Bee Skep. It looks very old punched with the darker background threads and has the feel of an old carpet or rug. I used Valdani threads, punched on weavers cloth and then mounted to this old wood pan with acid free adhesive and carpet tacks. I think this unusual board was some kind of dust pan or bread crumb catcher. I'm not for sure on that, but I just thought it was a neat board. There are also some curly etching in the wood. There is a slot at the top for hanging on a nail. I slipped a piece of brown suede cord through the slot for hanging longer. It can be removed it you want. The measurements are 7" wide by 6" long. A one of a kind designed and punched by me. It will be signed, dated and copyright. 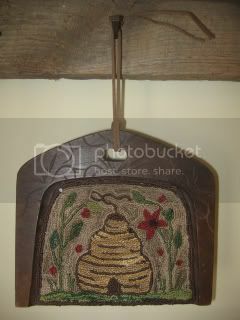 I have stitched on a little hanging pinkeep stitchery of a bee skep, bees and some curly vines. 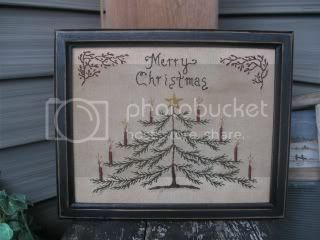 It was stitched all in very dark brown almost black with 2 strands of dmc threads on Moda fabric. 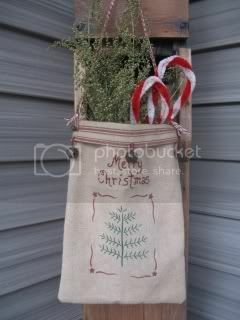 I used a waxy dark brown twine for the hanger which was attached with rusty safety pins, bells and bows. It's an adorable spring thyme hanger for a peg, nail or knob. It was very lightly coffee dyed, the backing (which I forgot to photo is tan with tiny white flowers, take my word for it, it is pretty and compliments the front perfectly). I stuffed it with some polyfil and muslin snipets. The measurements are a tiny 3"wide x 5"long. Designed and stitched by me, it will be copyright, dated and signed. Bring some spring into your home, its long overdue!! 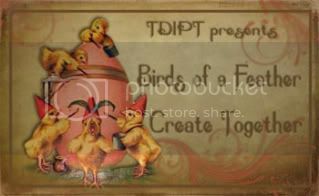 "Birds of a Feather Create Together" going on NOW! 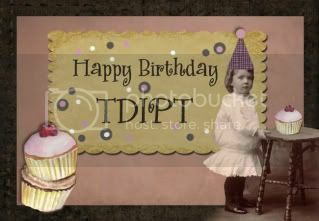 Please join the artists of the TDIPT Mercantile on eBay for auctions beginning today, Sunday February 21st with more offerings being added all week long! I will listing on Tuesday. Please come on by! Hello and welcome to my selling blog. It's been ages since I had any offerings. I feel like I should have some Valentines designs, but I think I am a tad late for that! So I am thinking Spring and Easter! Its been a long winter for most of our country so maybe a look around here will chase those winter blues away! I have 3 new offerings and I thank you so much for stopping by. Above I have a sweet little chick sitting on an Easter egg. 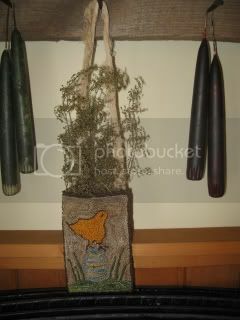 I designed and needle punch this hanging pocket on weavers cloth using Valdani threads. It was coffee dyed for that old time prim look we love. 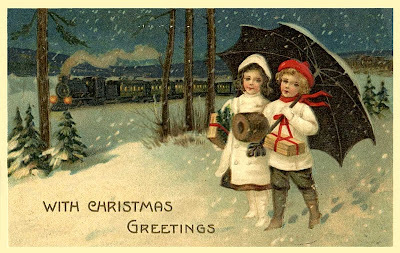 I hand sewed a nice brown wool on the back, attached a piece of coffee dyed cheese cloth by 2 rusty safety pins and slipped in a sprig of Sweet Annie. The measurements of the needle punch are 3 1/2"wide x5 1/2" long. A prim looking piece to use in your Easter decorating. It will be signed, dated & copyright. This little chocolate bunny is ready for spring and summer, much like the rest of us! 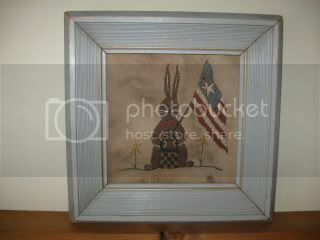 I stitched this bunny with his spring basket, flag and yellow tulips. I did my stitching on coffee dyed osnaburg. 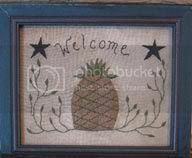 This cute primitive blue frame looks wonderful with this design. There is glass and sawtooth hanger. Measurements are 8 3/4" x 8 3/4". 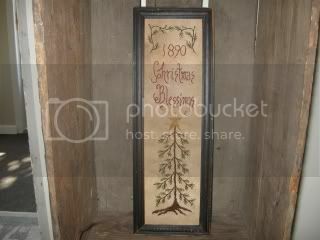 A nice size that can either be hung up or it is small enough to prop up in a cupboard. It will come signed, dated and copyright. 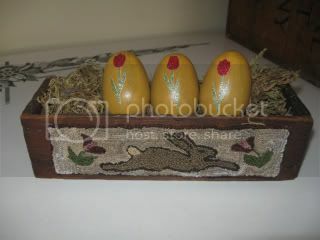 Here is a little Easter vignette I made using a needle punch design that I put on an old cheese box with some eggs in it. I needle punched my leaping rabbit between 2 tulips. It was punched on weavers cloth with Valdani and DMC threads. I attached the design with an acid free adhesive and some tiny carpet tacks in the corners. I filled the box with brown and green sea moss and 3 eggs. I painted the eggs mustard, aged them and buffed them up with some minwax. The glittery tulips on the eggs are stickers from Martha Stewart. If they are a little too flashy for you, just turn the eggs around. The dark brown cheese box measures 9"x3"x3". I had alot of fun putting this one together and I think it would look so cute sitting on someones cupboard or shelf this Eastertime! An original design, signed, dated and copyright.